ImaGem’s light behavior is based on direct measurement and human perception. With our system, what you see is what you get. With this system we select diamonds that are brilliant; diamonds that dance with light and show beautiful patterns. All of these qualities in a diamond are essential to its beauty. We use three factors to determine beauty in a diamond: brilliance, sparkle and intensity. Brilliance tells you how much light is coming back to your eye from the diamond. Higher the brilliance measure, the higher is its light return. A diamond with low brilliance will appear to be dull. Sparkles are flashes of light that you see when a light interacts with a diamond. Sparkle gives a diamond “life” or “pizzazz”. Greater the number of flashes, higher is its sparkle. A diamond with low sparkle will appear to be lifeless. Intensity in diamonds represents a strong pattern of dark and light areas which is very attractive. A diamond with low intensity will appear to be cloudy or foggy like a piece of frosted glass. With ImaGem’s light behavior rating, you will not be fooled by the special lighting in the store. 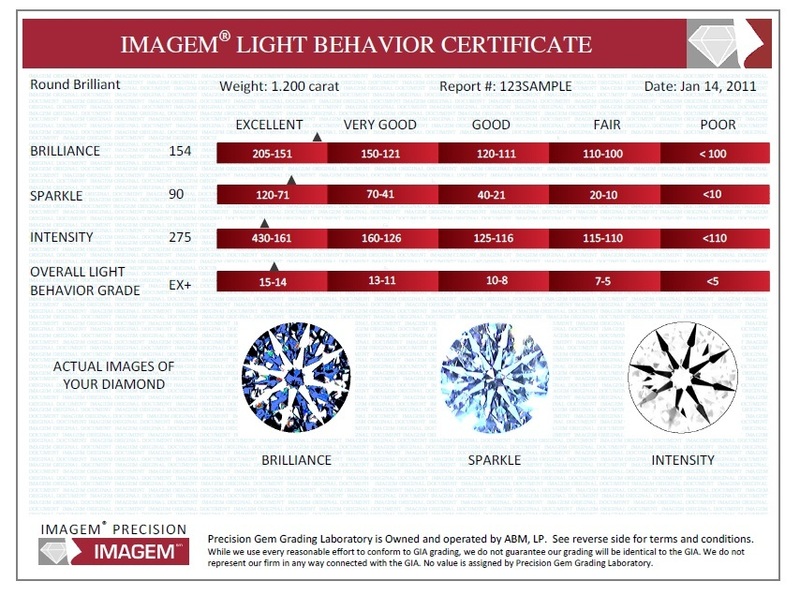 We carefully select diamonds that rate high on ImaGem’s light behavior to make sure you choose from a selection of only the most beautiful diamonds. Sample of a Light Behavior Certificate by ImaGem Inc.